This casual contemporary end table will add great style and functionality to your living room, perfect placed next to a chair or sofa. The table's arched sides with open grid work offer a subtle and sophisticated mission influence. Place a lamp or your favorite decorative items on this table for a personal touch in your space. A lower shelf offers more space for decorative items. In a warm dark Cherry finish, this end table will blend beautifully with your living room decor. 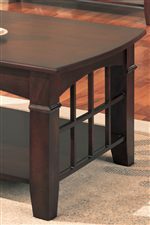 The Abernathy End Table with Shelf by Coaster at Standard Furniture in the Birmingham, Huntsville, Hoover, Decatur, Alabaster, Bessemer, AL area. Product availability may vary. Contact us for the most current availability on this product. Finish & Paint Options Deep dark Cherry finish. Case Detail Notched tapered legs, smooth edges. Description: Top Smooth tops with gently curved ends. Create a casual contemporary look in your living room with the Abernathy collection. This group of end tables features a warm style, with gently arched sides, and a repeating open grid motif. Add your own decorative items for a unique look and personal style. The coordinating end table, coffee table, and sofa table are finished in a deep Cherry that will complement your decor, helping you create an inviting space that everyone will love. The Abernathy collection is a great option if you are looking for Casual furniture in the Birmingham, Huntsville, Hoover, Decatur, Alabaster, Bessemer, AL area. Browse other items in the Abernathy collection from Standard Furniture in the Birmingham, Huntsville, Hoover, Decatur, Alabaster, Bessemer, AL area.